Been waiting to go on a trip somewhere exotic? You don’t need to go too far! This year, plan a trip to misty valleys, countless waterfalls and lush green hills of Cherrapunji. 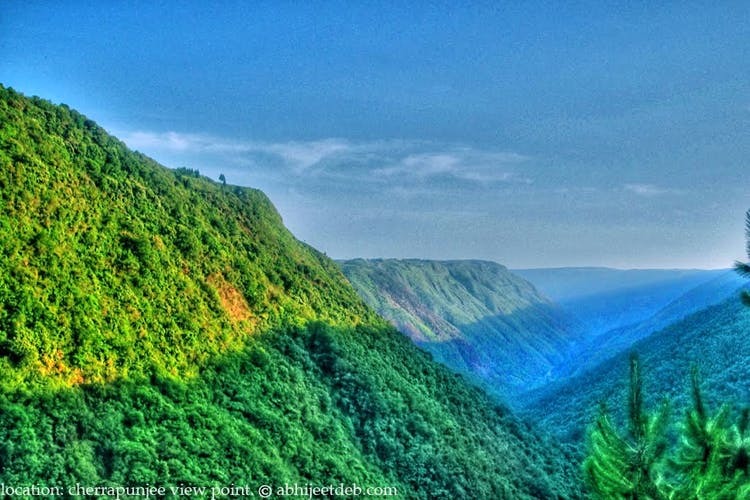 Located in the heart of Meghalaya, a.k.a the ‘abode of clouds’, Cherrapunji is not only a nature lover’s paradise but also filled with thrilling experiences for the adventurous soul! Trekkies, you’re going to love this! Cherrapunji is filled with trekking trails surrounded by beautiful scenic views. Make your way through a jungle trail to reach the world famous and one of a kind, Double Decker Living Root Bridge. Located at a height of 2400m, reaching this bridge might be a task but one that’s totally worth it! #LBBTip: Make sure you’re physically fit for the trek, and carry enough bottles of water to keep you going. #LBBTip: For the best views of Seven Sisters Falls, make sure you plan your trip during the monsoon season. In contrast to the reputation of Indian villages, take a trip to this hidden gem called Mawlynnong, a.k.a the cleanest village in Asia! Visiting Mawlynnong is like entering a fairy-land. With cute huts, cobbled streets, manicured lawns, and the clean surrounding will finally make your OCD take a backseat. The village also hosts a number of man-made living root bridges, and the highest point of the village, The Sky View, offers a surreal experience of looking down at treetops. If you haven’t heard, Adventure Caving has been on top of the list for many adventure-seekers who visit Meghalaya from all over the world. Cherrapunji has a number of natural caves, which include Krem Mawsmai, Krem Mamluh and Krem Umshyrpi, for you to explore the wonders of stalagmite and stalactite. This one’s for the adrenaline-rush junkies. Indulge in a thrilling experience of gliding across the verdant valleys of Cherrapunji with a kickass zip-lining experience. Superior equipment helps you soar across the breathtaking valleys, and get a bird’s eye-view of the scenic wonders of Cherrapunji. #LBBTip: They say that the experience is best between August and February. Imagine waking up to the serene views of Seven Sisters Falls or sipping on hot coffee while you enjoy the amazing views of Plains of Bangladesh, all from the comfort your room. Polo Orchid Resort is perfect for peaceful holidays like these. Take your pick from Log Huts with plunge pools and Misty Mountain Villas to Dew Drop Cottages overlooking the magnificent valleys of Cherrapunji. Head over to Rain Cafe that serves a myriad of cuisines to enjoy scrumptious delights. Visit their website to get all the details. Check out ML05 Cafe on your way to Cherrapunji for the perfect stop for snacks and beverages. You might want to keep a close check on weather updates before planning this trip. For more details and updates on Polo Orchid Resort, follow them on Facebook and Twitter to stay updated!